The Navy has to strike a tricky balance on the numbers of carriers it fields between providing forces for U.S. military and finding enough money to operate and maintain the high dollar ships, the commander of U.S. Fleet Forces said during a question and answer session following a Wednesday speech at the West 2014 conference in San Diego, Calif.
“We don’t want to get rid of anything,” Adm. William Gortney said. Gortney’s service’s latest bid to reduce the carrier fleet — by decommissioning USS George Washington (CVN-73) when its due for its midlife refueling — has been stopped as part of the Fiscal Year 2015 budget due to White House pressure. Reducing the U.S. carrier fleet from 11 to 10 has been a cost cutting measure the Navy has considered as a money saving option going back to at least 2011. Though the carrier is probably safe in the 2015 budget, there are increasing calls in Washington for the service to look for cost savings in reducing the carrier fleet and makes the ships a target in future budget submission. Operating an aircraft carrier can cost hundreds of millions of dollars a year in primarily the personnel cost of the 4,000 sailors in the combined between the ship’s crew and air wing. 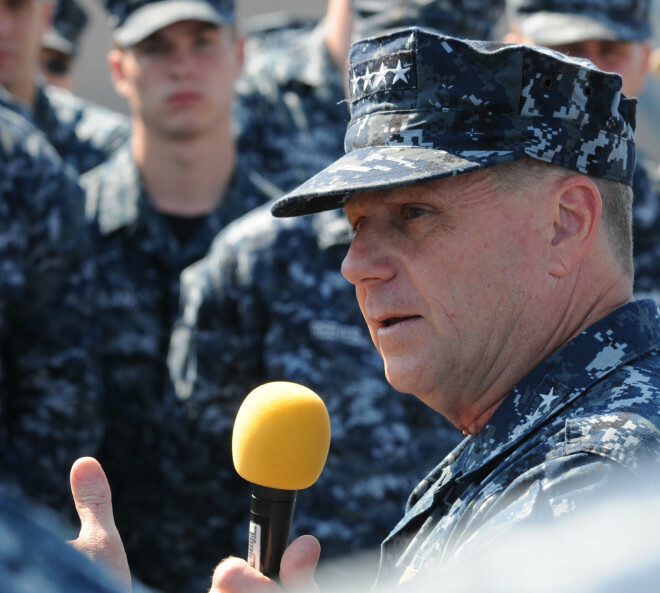 Gortney addressed the loss of Washington directly saying that it would mean that any cost savings would mean higher operational tempo for sailors left to man the carriers. “The question is what is the impact say of GW going away really occur? The impact occurs in about  which is supposed to come back into the rotation and we will go back to nine and 10 months deployments,” Gortney said. Carrier deployments are scheduled for six months, but carriers have averaged nine to ten months in the last several years due to budget woes brought on by unexpected budget restraints and requirements to surge forces forward. In January, Gortney unveiled the Optimized Fleet Response. It is an FRP that will lead to eight-month deployments in a 36-month cycle that includes maintenance and readiness and would result in sailors being home 68 percent of the time.